America’s image is on balance positive in most of the nations surveyed, and overall there has been little change since last year. 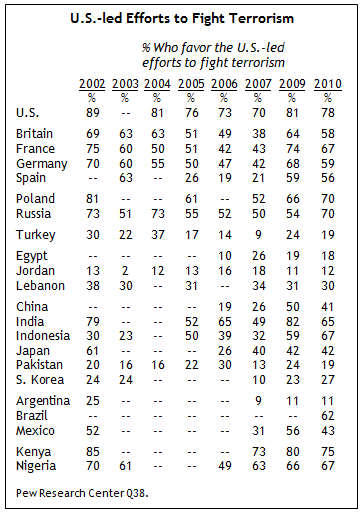 Looking at the 20 countries surveyed for which 2009 trends are available, positive views of the United States have become more common in six nations, less common in six, and have remained about the same in eight. But there have been notable shifts in some countries, including significant improvements in Russia and China. Driven by President Obama’s popularity in the region, favorable ratings for the U.S. in Western Europe soared between 2008 and 2009, and in this year’s poll attitudes remain overwhelmingly positive in Britain, France, Germany and Spain. Opinions about the U.S. have turned sharply negative, however, in Mexico, where resentment of Arizona’s new immigration law is fueling a backlash against the U.S., the American people, and even against President Obama, who has publicly criticized the measure. And, despite the continued favorable image of the U.S. in most parts of the world, in nine of the fifteen countries where comparable data is available, America’s favorability still lags behind that found in 1999/2000 at the end of President Bill Clinton’s time in office. The U.S. is only more popular in five countries than in the Clinton era – France, Spain, Russia, South Korea and Nigeria. The U.S. also continues to face image challenges in predominantly Muslim nations. Roughly one year since Obama’s Cairo address, America’s image shows few signs of improving in the Muslim world, where opposition to key elements of U.S. foreign policy remains pervasive and many continue to perceive the U.S. as a potential military threat to their countries. Concerns about American foreign policy are not limited to Muslim publics, however. Most notably, in regions across the globe, there is a common perception that the U.S. acts unilaterally in world affairs. The war in Afghanistan also remains widely unpopular, although publics among some of America’s European allies are closely divided on this issue. Support for the war has declined over the last year in the U.S. and Americans are also now about evenly split between those who want to keep troops in Afghanistan and those who favor withdrawal. One issue on which Americans and Western Europeans differ sharply is how they perceive religiosity in the U.S. By a hefty margin, the French, British and Germans say the U.S. is too religious a country, while Americans overwhelmingly think their country is not religious enough. On this issue, Americans tend to agree with the rest of the world – in 17 of 21 countries people tend to say the U.S. is not sufficiently religious. Majorities or pluralities in 17 of 21 countries have a very or somewhat favorable opinion of the U.S. The biggest increase in favorable ratings for the U.S. has been among Russians. In America’s former Cold War nemesis, 57% now have a positive view, up 13 percentage points from last year. There was also a significant increase in the other former Eastern bloc nation included in the survey, Poland, where 74% express a favorable opinion, up from 67% in 2009. Among America’s key Western European allies, ratings remain generally positive and largely steady. After a steep decline in approval during the years of the Bush presidency, large majorities in all four Western European nations surveyed now express a positive attitude toward the U.S. Fully 73% in France give the U.S. positive marks, essentially unchanged from last year. U.S. favorability dropped just slightly in Britain, from 69% to 65%. Again this year, just over six-in-ten in Germany (63%) and Spain (61%) offered a favorable assessment. Favorable ratings for the U.S. have suffered a double-digit decline in Egypt. 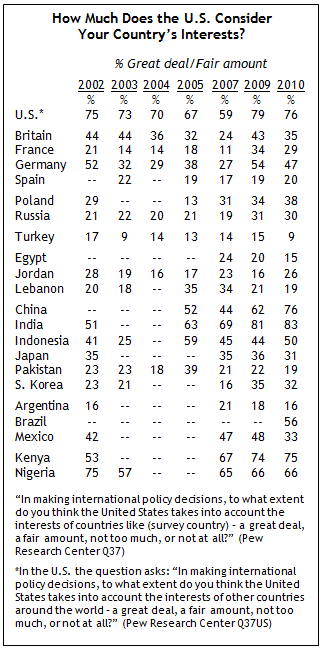 In 2009, 27% of Egyptians had a favorable opinion, but this year only 17% hold this view, tying Egypt with Turkey (17%) and Pakistan (17%) for the lowest U.S. favorability rating in the survey. Views of the U.S. are only slightly more positive in Jordan, where 21% give a favorable assessment, down somewhat from 25% last year. The two predominantly Muslim countries that accord the U.S. its most positive ratings are Lebanon (55%) and, especially, Indonesia (59%), where President Obama’s personal connection to the country buoys America’s overall image. Ratings for the U.S. have improved markedly in China – 58% have a positive view this year, up from 47% last year. 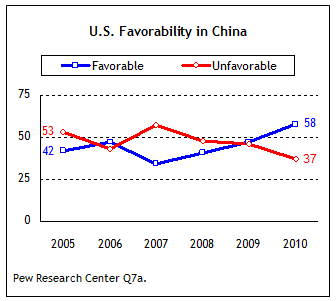 America’s image has been steadily improving in China since 2007, when only 34% expressed a favorable opinion. Favorable ratings have become less common over the last year in India, dropping 10 percentage points. Nonetheless, 66% of Indians continue to hold a positive opinion of the U.S.
An identical percentage of Japanese (66%) voice a positive view. And despite the July 2009 election of a new ruling party that, according to many observers, has voiced criticisms of American policies, U.S. favorability has actually risen seven percentage points since the spring 2009 poll. 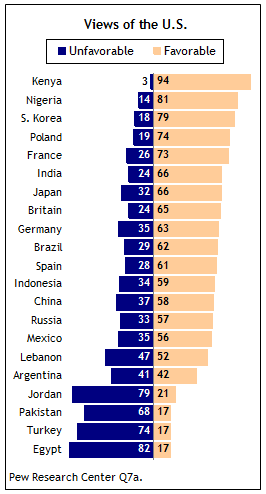 Elsewhere in Asia, South Koreans continue to give the U.S. overwhelmingly positive marks (79%). The only publics giving the U.S. higher marks than South Koreans are the two nations surveyed in sub-Saharan Africa. Roughly eight-in-ten (81%) have a positive view in the continent’s most populous country, Nigeria. And with near unanimity, Kenyans (94%) voice a positive opinion of the U.S. Additionally, President Obama is extremely popular in Kenya, and the 2009 Pew Global Attitudes survey found that the vast majority of Kenyans were aware of his personal connection to their nation (his father was from Kenya). However, the U.S. was also relatively popular in Kenya, and in much of Africa, during George W. Bush’s presidency. The biggest decline in overall ratings for the U.S. occurred in Mexico, the result, in part, of a backlash against the recently passed immigration bill in Arizona. Overall, favorable opinions of the U.S. have dropped from 69% to 56% in Mexico since 2009, but there are sharp differences between those interviewed before and after the Arizona measure was signed into law by Gov. Jan Brewer on April 23, 2010. Among respondents interviewed from April 14-20, 62% had a positive view of the U.S., compared with just 44% of those interviewed May 1-6. Nearly two-thirds (65%) of Mexicans surveyed after the law’s enactment have heard of the new law, including 23% have heard a lot about it; one-in-four have not heard of it. When asked how leaders on both sides of the border are handling the controversial new measure, Mexicans generally offer negative assessments. In particular, Gov. Brewer gets poor marks – 75% disapprove of the way she has dealt with the law. And even though U.S. President Barack Obama has criticized the new law, a majority of Mexicans (54%) disapprove of the way he has handled the crisis. Evaluations of Mexican President Felipe Calderón are not as negative, although on balance more respondents disapprove (43%) than approve (25%) of his performance. Among the Muslim populations surveyed, Indonesia and Nigeria are the only countries in which most Muslims have a favorable view of the U.S. Seven-in-ten Nigerian Muslims express a positive opinion, up from 61% last year. The country’s Christian population continues to give the U.S. extremely high ratings – 92% offer a favorable opinion. Overall, 39% of Lebanese Muslims have a favorable view of the U.S., but this masks deep divisions within the country’s Muslim population. Roughly three-in-four (74%) Lebanese Sunni Muslims express a positive opinion. While this is down from last year’s extraordinarily high 90%, it is still higher than in 2007 and 2008, and is a much more positive rating than the U.S. receives among the largely Sunni Arab populations of Egypt and Jordan. 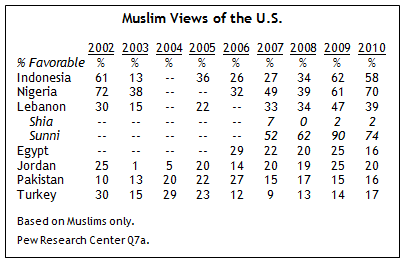 However, almost no Lebanese Shia Muslims (2%) have a positive opinion of the U.S. Meanwhile, 74% of Lebanese Christians have a favorable view, up from 66% in 2009. Majorities in all six predominantly Muslim nations surveyed say they are very or somewhat worried that the U.S. could pose a military threat to their country someday. After dropping steeply between 2007 and 2009 in Jordan and Egypt, concerns about a U.S. threat have risen slightly in both countries this year. The trend has moved sharply in the opposite direction however, in Pakistan, where 65% see the U.S. as a potential military threat, down from 79% in 2009. Despite having relatively positive views of the U.S. on other measures, Indonesians continue to express a high degree of concern about a potential U.S. threat (76%). The American people receive largely positive ratings among the nations surveyed, with majorities or pluralities in 16 of 21 countries saying they have a favorable opinion of Americans. Moreover, on balance, attitudes towards Americans have grown somewhat more positive in the last year. Among the 20 countries outside the U.S. where trends are available, favorable views of the American people have increased in nine countries, remained about the same in 10, and decreased in only one. The largest increase took place in China, where positive views of Americans jumped from 42% in 2009 to 61% in this year’s poll. Sizeable increases also occurred in Poland (+8 percentage points), Russia (+7 points) and Spain (+7 points). The only nation in which the image of the American people declined was in neighboring Mexico. Overall, 49% of Mexicans voice a positive opinion of Americans, down from 57% last year. 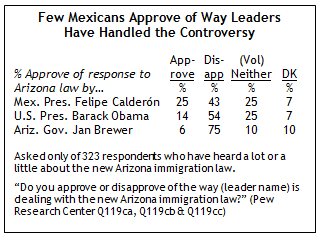 Here again, Mexican public opinion was very different before and after the passage of the Arizona immigration law. Prior to the law’s enactment, 55% held a positive view of Americans, but this plummeted to 39% afterwards. By far, Turks (16%) and Pakistanis (18%) give Americans their lowest favorability rating, and less than a majority express a positive opinion in Egypt (39%), Argentina (39%) and Jordan (44%). The belief that the U.S. tends to act unilaterally in world affairs remains widespread in this year’s survey. Majorities in only five nations say the U.S. takes into account the interests of countries like theirs when making foreign policy decisions. The U.S. receives its most positive marks on this issue in India, where more than eight-in-ten (83%) say America considers the interests of countries like India a great deal or a fair amount. In China, 76% believe the U.S. considers their interest when making foreign policy, up from 62% last year. Big majorities also hold this view in the African nations surveyed: Kenya (75%) and Nigeria (66%). In no European country surveyed does a majority think the U.S. takes their interests into account. Between 2007 and 2009, the British, French and German publics became much more likely to believe the U.S. considers their interests. However, this view has become slightly less common in all three nations over the last year. The share of the public who think the U.S. considers their interests has dropped eight percentage points in Britain, seven in Germany, and five in France. There are five countries where fewer than 20% believe the U.S. considers their interest: Pakistan (19%), Lebanon (19%), Argentina (16%), Egypt (15%) and Turkey (9%). This single-digit number in Turkey is down six percentage points since last year, and is as low as it was in 2003, shortly after the start of the Iraq war. Americans tend to see this issue quite differently from much of the rest of the world. When asked how much their country takes into account the interests of other countries around the world, 76% of Americans say a great deal or a fair amount. This is little changed from last year, but is significantly higher than in 2007, when 59% of Americans expressed this opinion. Majorities in 12 of the 22 countries surveyed say they favor U.S.-led efforts to fight terrorism, including all four Western European countries. Support for American anti-terrorism efforts rose substantially in Western Europe between 2007 and 2009, and it remains high in this year’s poll, although support has declined a bit in Britain, France and Germany. A similar pattern can be seen in India and China, where support for the U.S.-led anti-terrorism campaign increased sharply between 2007 and 2009, but has fallen significantly in the last year, dropping 17 percentage points in India and nine points in China. Support for these efforts is consistently low in the Middle East and Turkey, as well as in Pakistan – a nation crucial to American efforts to combat al Qaeda and similar groups. Only 19% of Pakistanis say they favor U.S.-led anti-terrorism efforts, down from 24% last year. U.S. anti-terrorism policies are widely endorsed in both Poland (70%) and Russia (70%), and in the latter support is up 16 percentage points from last year. Kenyans (75%) give these policies their highest level of approval outside the U.S. Two-thirds also favor these efforts in Nigeria, but there are major differences along religious lines. Among Nigerian Christians, 86% favor U.S.-led anti-terrorism efforts, while only 9% oppose them. There is less support among the country’s Muslim population (47% favor and 41% oppose). The war in Afghanistan remains unpopular in most of the nations surveyed. Majorities or pluralities in 16 of 22 countries believe U.S. and NATO forces should be withdrawn from Afghanistan as soon as possible. In six nations, majorities or pluralities say these troops should be kept there until the situation stabilizes. Support for the war is especially low in predominantly Muslim nations, including Pakistan, which borders Afghanistan, and like Afghanistan, is facing serious security threats from the Taliban and other extremist groups. Only 7% of Pakistanis want the U.S. and NATO to keep troops in their neighboring country, while 65% call for a troop withdrawal and 28% offer no opinion. Similarly, only 11% in NATO ally Turkey think coalition forces should remain in Afghanistan, while just 15% of Egyptians, 13% of Jordanians, and 21% of Lebanese hold this view. Even in Indonesia, where attitudes toward the U.S. and toward American foreign policy specifically are generally more positive than among other largely Muslim nations, only 19% want troops to stay. The conflict is also unpopular elsewhere, including China (18% keep troops) and Japan (35%). On balance, however, South Koreans and Indians are more likely to favor retaining troops in Afghanistan than withdrawing them. Americans are almost evenly divided on this issue: 48% want troops to stay, while 45% favor withdrawal. There are significant partisan differences, however: 65% of Republicans want to keep U.S. and NATO forces in Afghanistan, compared with 50% of independents and only 36% of Democrats. A different trend is apparent among some of America’s key European allies. The fall 2009 survey found that support for the war had slipped in several major NATO nations between spring and fall 2009. But the current poll finds support rebounding a bit in Britain and France, where about half now say troops should stay, as well as in Spain and Poland, where roughly four-in-ten now hold this view. Among the nations surveyed, there is relatively little optimism about Iraq’s political future.5 Majorities or pluralities in only seven of 22 nations believe efforts to establish a stable government in Iraq will definitely or probably succeed. In 12 nations, fewer people think these efforts will succeed than was the case last year; more people hold this view in two, while public opinion has remained essentially steady in six nations. Turks, who share a border with Iraq, are the least optimistic: only 12% think efforts to establish a stable government will succeed. In Jordan, which also borders Iraq, the belief that these efforts will succeed has become much less common over the last year, decreasing from 50% to 36%. About four-in-ten hold this view in the two other Arab nations surveyed, Lebanon (43%) and Egypt (40%). 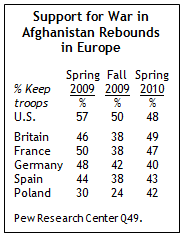 Western Europeans are consistently less optimistic about Iraq’s prospects than they were in 2009. The percentage saying a stable government will be established has declined significantly in Spain (-8 percentage points), Britain (-7 points), France (-7 points) and Germany (-7 points). There have been declines in other nations as well, including Nigeria (-22 points), China (-20 points), South Korea (-11 points), Argentina (-8 points) and Mexico (-8 points). Americans are also slightly less hopeful about Iraq this year – 45% say they think efforts to create a stable government will be successful, down from 49% last year. Democrats (39% succeed) are less optimistic than independents (47%) or Republicans (51%). The survey finds a fair amount of cross-national agreement regarding one aspect of America’s image: its religiosity. When asked whether the U.S. is too religious or not religious enough, majorities or pluralities in 18 of 22 countries say it is not religious enough. This is especially true in all three Arab nations surveyed – Jordan (89%), Egypt (81%), and Lebanon (64%) – as well as in Indonesia (67%) and Pakistan (55%). Majorities also hold this view in India (57%), Brazil (55%), Mexico (56%), Kenya (53%) and Nigeria (57%). The exceptions on this question are the economically advanced nations of Western Europe and Japan. 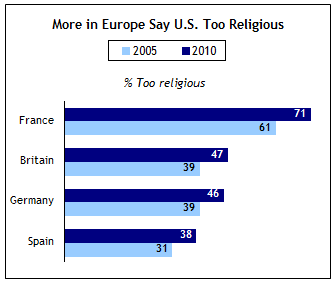 In particular, the French are considerably more likely than others to see the U.S. as too religious (71%). More than four-in-ten feel this way in Britain (47%), Germany (46%) and Japan (42%). The Spanish are divided: 38% think the U.S. is too religious and 40% believe it is not religious enough. Interestingly, the perception that the U.S. is an overly religious nation has become more common across all four Western European nations since the last time the Pew Global Attitudes Project asked this question in 2005, in the middle of the George W. Bush era. Americans tend to disagree with their transatlantic allies on this question: 64% say their country is not religious enough, up from 58% in 2005. Republicans (81%) are especially likely to hold this view, although majorities of Democrats (60%) and independents (56%) agree.